Travel guide, planner, and organizer! Sabine Rautenberg holds a master's degree in business management and lives in Germany with her husband, Manuel. Her love for all things Disney started in 1992, when, at the age of 10, she watched the grand opening ceremony at Disneyland Paris (then known as Euro Disney) on TV. An avid traveler, Sabine has visited places all over Europe, America, Asia, and Africa. She and her husband especially love embarking on Disney cruises, in addition to spending time at Disney parks all over the world. Sabine has been a PassPorter Message Board Guide since 2007, a peer reviewer for various PassPorter guidebooks, and a guest contributor to PassPorter's newsletter. Because Disneyland Paris holds a special place in her heart, Sabine took on the challenge of writing PassPorter's Disneyland Paris without thinking twice. If you already have a copy of PassPorter Walt Disney World, PassPorter's Disneyland, or PassPorter's Disney Cruise Line, this e-book is filled with entirely new stuff. We think of it as the information we would like to include in our printed guidebooks if we had the room. Explore a magical place where The Mouse speaks French! 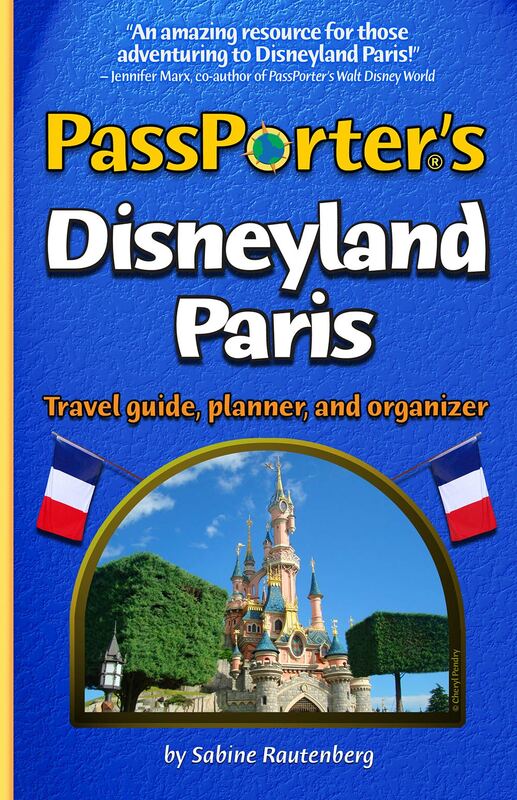 PassPorter's Disneyland Paris is a comprehensive, 204-page e-book covering every aspect of visiting Disneyland Paris, including traveling to France from the United States and the United Kingdom. Disneyland Paris comprises two theme parks, a shopping and entertainment district, six resort hotels, a ranch, a golf course, and so much more. This e-book provides all the information you need to get the most out of your stay at this exciting vacation destination, plus it makes planning a lot of fun! Among the features of PassPorter's Disneyland Paris are detailed descriptions of all the attractions and restaurants at Disneyland Park and Walt Disney Studios Park, a look at Disney's on-site hotels and the partner hotels off property, and coverage of shopping options at the resort and in the area. Additionally, this e-book contains PassPorter's comprehensive maps of the theme parks, the Disney Village shopping and entertainment district, and all of Disney's hotels! We supply tips on how to stay healthy, safe, and in touch, along with information about flying and international travel--including what to expect when arriving in France, duty-free allowances, passports, and immigration. Furthermore, we offer advice for travel via train, ferry, bus, or car; need-to-know facts about driving in France; plus how to get to Disneyland Paris from the airport or Paris' central train station. Traveling abroad often means dealing with foreign currency. This e-book compares different payment options like credit cards, traveler's checks, and cash and has helpful tips for setting up a vacation budget. Handy clip-and-save currency-conversion-rate tables help you calculate how much your dollar or pound might buy you in France. Because Disneyland Paris is located in a beautiful, scenic region near the French capital, we've included a look at what Paris and its surrounding areas have to offer. This includes an overview of the most popular sights, information on tours offered through Disney, and details on the nearby Val d'Europe shopping center. 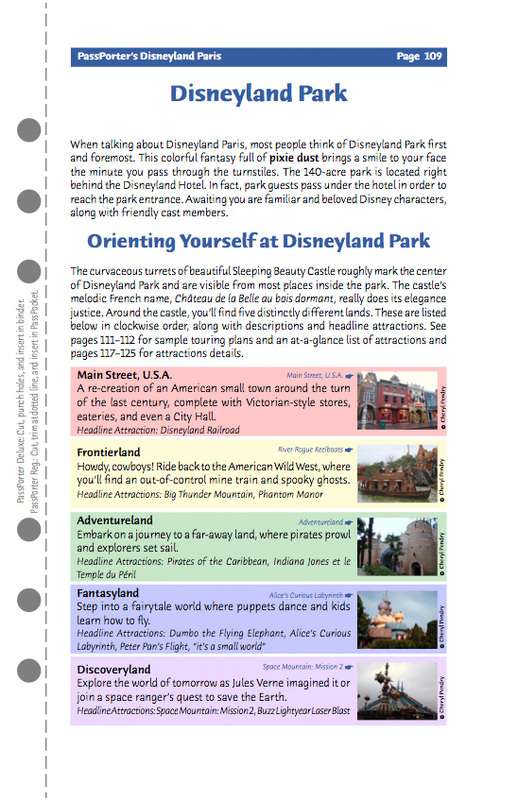 PassPorter's Disneyland Paris contains a number of interactive worksheets designed to help you plan different aspects of your vacation. For example, you can track your spending using the Budget Worksheet, map out a plan for seeing the parks using the Touring Worksheet, or scribble down the mementos you're seeking on the Souvenirs Worksheet. This e-book is available immediately to our PassPorter's Club passholders, free of additional charges. The e-book os also available to everyone to purchase in our store for only $8.95. Tip: Get this e-book now and FREE of extra charges as part of the PassPorter's Club program starting at $4.95 a month with access to ALL our e-books and e-worksheets! This e-book is 204 pages long and 7.3 MB. Like all our e-books, this file is fully formatted just like a regular print book... it will even fit into a Deluxe PassPorter Binder, if you have one. BONUS: Owners of this e-book receive a valuable 30% off discount coupon for any of PassPorter's print guidebooks! The coupon is located inside the e-book (page 196). This e-book is available immediately to our PassPorter's Club passholders, free of additional charges. The e-book is also available to everyone to purchase in our store for only $8.95. Tip: Get this e-book now and FREE of extra charges as part of the PassPorter's Club program starting at $4.95 a month with access to ALL our e-books and e-worksheets! Potential Readers: If you are unsure if this e-book can help you, please feel free to contact us for advice. If we don't think this book is for you, we'll tell you. If you already have one of our printed PassPorter Walt Disney World guidebook, you'll probably love this e-book! Questions: If you have questions about this e-book, please contact us prior to purchase and we'd be happy to assist you. Shipment: It's free! This e-book has no shipping or handling fees -- it is available as an electronic file (Adobe PDF) only. You will be able to download your file to your computer IMMEDIATELY -- no shipping delays. Instructions on how to print the e-book are provided at the end of the e-book's text. Terms: Satisfaction is guaranteed! If you are unhappy with this e-book, we will issue a refund. If you are unsure about purchasing this e-book, please be assured that PassPorter is trustworthy. We have been selling our guidebooks online and in bookstores since 1999 -- we have over one million happy readers! Ask about us on Disney message boards!